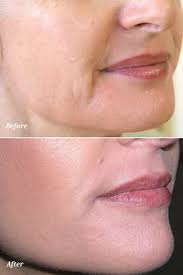 Dermal fillers, also known as injectable implants, soft tissue fillers, or wrinkle fillers are medical device implants approved by the Food and Drug Administration (FDA) for use in helping to create a smoother and/or fuller appearance in the face, including nasolabial folds, cheeks and lips. Facial fillers replace the skins substances, that when lost, cause wrinkles, folds and loss of volume to areas of the face. The skin thins by loss of collagen and fluid. In youth, the skin remains hydrated from a natural sugar called hyaluronic acid that attracts and binds to the body’s water. Dermal fillers are substances that can be injected to fill wrinkles and facial depressions, that tend to come with age. At Blackpool Aesthetics we aim to give our clients a more natural looking improvement. Therefore, when administering filler treatments, we believe less is always best. This allows you to opt for more filler if required, to achieve the desired look. All our Dermal fillers are FDA approved and licensed for use in the UK. All our Dermal fillers contain lidocaine for a more comfortable and less painful treatment. Before and after Nasolabial folds, Marionette lines and a subtle lip enhancement. Please contact us for prices on Blackpool dermal fillers and monthly offers.